SPAZ: The album is as stripped down as they become. 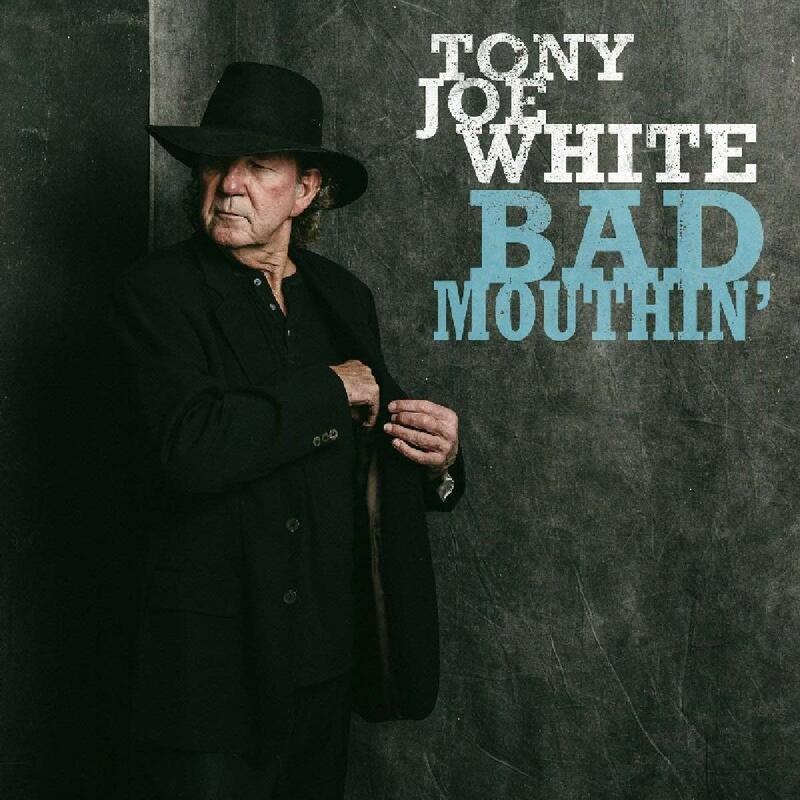 Do you feel that the Blues works best when it is as raw, primal, and haunting as it is on BAD MOUTHIN’? TONY: The kind of Blues I grew up on was always stripped down. Usually it was just one man with a guitar and harmonica tapping his foot. To me, that is the Blues. SPAZ: On the surface, Blues can seem very simplistic yet there is so much real emotion tied into the music. Is that what draws you to that style of music? TONY: Yeah. I like the way these guys told their stories – it’s what pulls you in. Everything about it feels true and honest. And most of the time, he ain’t up to no good and don’t mind telling you about it. SPAZ: BAD MOUTHIN’ includes covers and original material, both of which blend together very well on the album. How did you come to choose the cover versions for this project? TONY: Me and my son Jody, who produced the album, worked on it together. A lot of the songs like “Boom Boom” and “Big Boss Man” were songs I knew but then he pulled a few out that I didn’t know before like “Down the Dirt Road Blues”. SPAZ: Two of the originals on the album were written very early in your career. Were these songs that you had forgotten about over time? And what inspired you to revisit them now? TONY: I had forgotten all about those tunes. I wrote them back in the Corpus Christi days and they sort of fell by the wayside once everything started happening back in the ‘60s. Jody found them on the internet somewhere and thought it would be cool to recut them for this album. I like how they turned out. SPAZ: The recording is very intimate, which makes it easy to connect with the listener. Was that your intention on BAD MOUTHIN’? TONY: I don’t really go into music with any sort of intentions. I just play what I feel and what feels right. 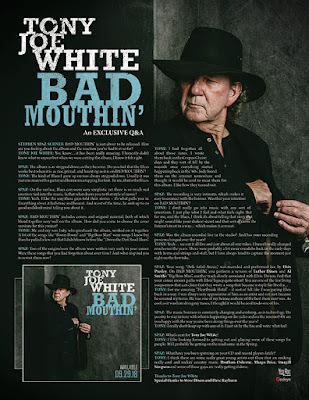 But for me, and the Blues, I think it’s about telling that story that might sound like your darkest secret and that sort of earns the listeners trust in a way… which makes it connect. SPAZ: Was the album recorded live in the studio? And has your recording process changed over the years? TONY: Yeah… we cut it all live and just about all one-takes. I haven’t really changed much over the years. There were probably a lot more overdubs back in the early days with horns and strings and stuff, but I have always tried to capture the moment just right on the first take. TONY: For me covering “Heartbreak Hotel” - it sort of felt like I was paying Elvis back in a way. I was always very appreciative of him as an artist and not just because he covered my tunes. He was one of my heroes and one of the best there ever was. As cool as it was him doing my tunes, I thought it would be cool to do one of his. SPAZ: The music business is constantly changing and evolving, as is technology. Do you try to stay in tune with what is happening on the radio and on the internet? Or are you happy with the way you’ve been doing things over the years? TONY: I really don’t keep up with any of it. I just sit by the fire and write what feel. 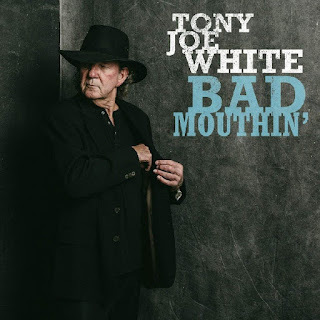 SPAZ: What’s next for Tony Joe White? TONY: I’ll be looking forward to getting out and playing some of these songs for people. Will probably be getting on the road some in the Spring. SPAZ: What have you been spinning on your CD and record players lately? 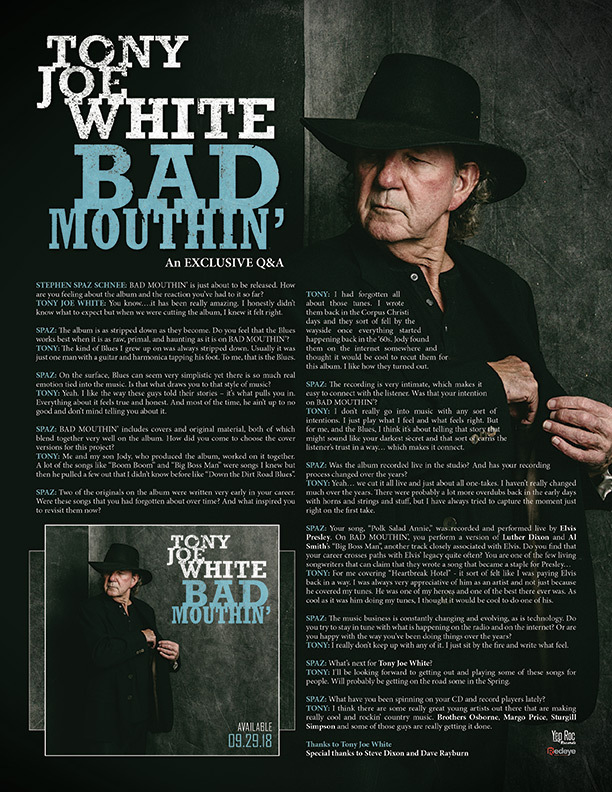 TONY: I think there are some really great young artists out there that are making really cool and rockin’ country music. Brothers Osborne, Margo Price, Sturgill Simpson and some of those guys are really getting it done.